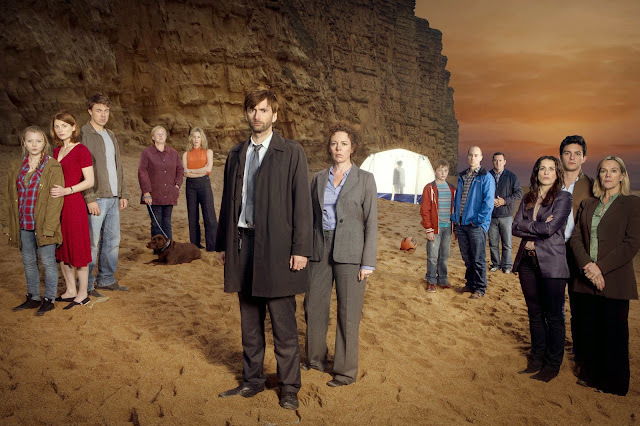 I have been watching Broadchurch, a mini-series about the murder of an 11-year old boy. It is a serious drama about the community and families in the small town affected by it. There is no comedy, no jokes, no funny stuff, as a real murder case would be like. My hubby did not want to watch it, saying it was too intense. In watching the 8-part series, you get a bit more into the lives of the characters in comparison to say an episode of Bones, both of which are stories of the whodunit genre. In Bones, you won't feel much about the murders at all. You just get an "ahh...that's how it was done and that's the person who did it. Ok, what's next." But in Broadchurch, you get more invested in the characters and with the discovery of the person who committed the murder in the end, why and how it was done makes you angry, and think how dismal humankind is, our self-importance, evil and our darkness. But it's a good show, and the acting is really good. I'm now looking forward to the second season. I think that it would have been better if it had a few less episodes. In contrast, Ann and I really liked "The Killing" on Netflix. Similar to Broadchurch but much more interesting characters. Ah...thanks. I will check out "The Killing". I find the number of episodes in Broadchurch was alright - I gets me to know the characters better.